From the Editor: Marilyn Winograd, a teacher of the visually impaired, and Dr. Lillian Rankel, a science teacher, work together to share techniques and strategies for including students who are blind or have low vision in all aspects of science education. They have given presentations to teachers of the visually impaired and parents of blind children across the country, and they have led hands-on workshops with children of all ages and abilities. Their book Out Of Sight Science Experiments, published in Braille and large print by National Braille Press, contains thirty-two step-by-step experiments for blind children to conduct at home or as part of a science fair project. They have also co-authored numerous articles on adapting chemistry lessons and labs for blind students. More information about their work can be found at www.sciencefortheblind.com. A two-year-old doing STEM activities? It is never too early to introduce children to science, technology, engineering, and math. By giving them subject-oriented materials for hands-on exploration, blind and low-vision children can be exposed to and have fun with STEM at an early age. Similar activities can be introduced and differentiated for children of other ages and abilities. Exposure to STEM at an early age will lead to integration and success in future classes and careers. We need to emphasize science, technology, engineering, and math to ensure that our children are prepared for college and the careers of tomorrow. Simple hands-on STEM activities can be carried out with materials found around the house. STEM activities can be fun for the whole family and can translate into life skills as well. Simple STEM activities can be carried out by the time a child is two years old. For example, pouring water from one container into two containers, sopping up water with a sponge and squeezing it out, running toy cars down a ramp, or holding an ice cube while it melts and becomes liquid water are just a few STEM activities that are fun for young children. When children explore STEM activities at an early age, they learn that science, technology, engineering, and math can be interesting and fun play. This positive attitude can lead to academic success and potential careers later on. Without Touching It, Can You Lift an Ice Cube? In this simple experiment, you will lift a floating ice cube with a string and a bit of table salt. Soak the string in the water and lay it on top of the ice cube. Sprinkle some salt on the string where it touches the ice cube's surface. Wait for about a minute and lift the ice cube out of the water with the string, which is now frozen to the ice. The salt melted the ice cube where the string touched it. Then the cold ice cube froze the water again, freezing the string to the ice cube. Can you lift two ice cubes at the same time with one piece of string? Can You Design an Aluminum Foil Boat that Can Hold Pennies? Fill a large bowl or pan with four inches of water. Take a six-by-six-inch piece of aluminum foil and shape it to form a boat. Float the foil boat on the water. Add pennies one at a time until the boat sinks. Use a new piece of foil the same size and redesign the boat to hold more pennies. 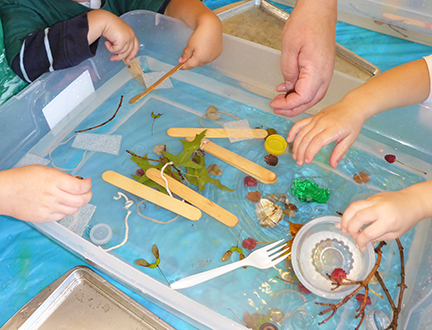 For a challenge try to make a three-by-three-inch boat and find out how many pennies it can hold and stay afloat. Have paper towels handy to mop up spills. Can you guess what is in a plastic egg without opening it? Use some plastic Easter eggs that open up and have holes at the bottom. Put a pinch of spice or a fruit or vegetable piece in each egg and snap it closed. Onion, orange, cinnamon, coffee, peppermint, garlic, basil, lemon, and banana are some good choices. Try to identify each smell by sniffing at the holes in the plastic eggs. Another activity is to put each fruit or vegetable in two eggs. Then match the smells in a group of eggs. Using a bowl filled with six inches of water is a good way to test what floats or sinks. Find random objects around the house such as sticks, plastic spoons, stones, toy cars, blocks, pencils, and crayons. Examine each item and predict whether it will float or sink. Now test your predictions. One by one drop each object into the bowl and observe whether it floats on top of the water or sinks to the bottom. All you need is some Jell-O powder (with sugar), an empty three-ounce plastic cup, a drinking straw, a three-ounce cup half filled with water, and a spoon. Want to Go Fishing without Going Outside? First you will need a fishing pole. Use a Popsicle stick or dowel six to eight inches long. Hang a doughnut-shaped magnet from a string attached to one end. Cut fish shapes from sheets of cardboard, index cards, or paper plates. Place a paper clip by each fish's mouth. You can put a Braille or large print number on each of the fish. For a fish pond, use a plastic or aluminum pan, shallow box, or large bowl. Now it's time to go fishing. Drop the magnets into the fish pond. Catch the fish by picking them up when the magnets stick to the paper clips. You can put the fish in numerical order or make addition and subtraction problems with the numbers on the fish that are caught. Fish with a partner and add up the numbers on the fish you each catch. The one with the highest total wins! For an alternative way to play this game, when initially making the fish, cut them in different sizes. The one who catches the biggest fish is the winner. Will the Orange Sink or Float? Cut a navel orange into quarters. You will also need a small pail or a large bowl filled with water and a work tray to catch water that may spill or splash. Predict what you think will happen, and then try it out. Place an orange slice, with the peel on, in the pail of water. 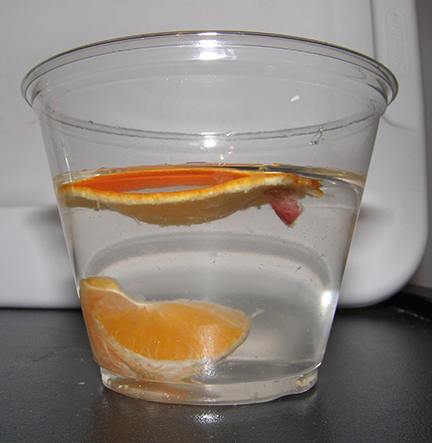 Does the orange slice float or sink? Now take the orange slice out of the water and peel off the skin. Again, predict what will happen. Put the slice back into the water. Does it float or sink? Place the orange peel in the water. Does the peel float or sink? You just found out that the orange peel acts as a life jacket for the orange. The peel has tiny air bubbles in it that help it float. The orange segment sinks without its peel, or life jacket, because it is heavier than water. Did You Ever Go on a Magnetic Scavenger Hunt? Get a strong magnet and walk through your house, trying to find objects that will attract it. Will the magnet work through water? Will it work through paper? Will it work through cardboard or plastic? Will it be attracted to parts of your shoes? Why Do We Hear Sound? Sound is energy that is made by vibrations. We easily can explore making different sounds. Gather items such as a wire hanger, metal spatula, and metal silverware of assorted sizes. Tie a piece of string to each item. Have your child hold each item by the string. Tap each one with a ruler. Listen to the sound each item makes. Touch the item hanging from the string when it is making a sound and feel the vibration. Attach a string to a coat hanger and wrap each end around a finger. Place your fingers in your ears. Then tap the coat hanger against a desk to hear the sound conduction through your fingers into your ears. Would You Like to Make a Bag of Gas? We can make carbon dioxide, the gas found in soda and our atmosphere. To start, get a one-quart Ziploc bag. Put two tablespoons of water into the bag, being careful to keep the zipper dry. Zip the bag halfway closed. Drop two Alka-Seltzer tablets into the bag of water and quickly zip it closed. 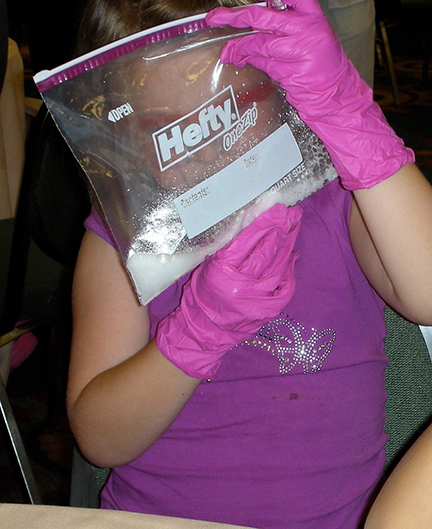 Shake the bag gently to wet the Alka-Seltzer tablets. Feel the tablets dissolving through the plastic bag. Place the plastic bag near your ear and listen to the bubbling sizzle of gas as it forms. Feel the bag puffing up like a pillow as the gas is released. Dissolving means that a substance breaks apart into very small particles and spreads out evenly throughout the water. Use a few plastic cups filled halfway up with water and gather some things to test for dissolving. Sugar, salt, sand, cookies, string, cereal, candy, and a powdered drink are some things to try. Make some predictions about what will dissolve and start testing. Put a spoonful of salt into a half-filled cup of water. Stir with your fingers to feel whether the gritty salt is dissolving. Stir for a few minutes to give the salt a chance to dissolve. Has the salt disappeared? Try some other substances. Does hot water dissolve things faster or more slowly than cold water? STEM activities encourage thinking, problem solving, observation, and a sense of exploration. Young students will not only master required skills; they will be able to unlock the doors before them and enter our global environment, proficient and prepared.